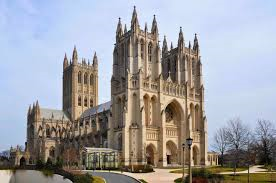 Islamofascism: On Friday, for the first time, the venerable Washington National Cathedral will be used as a mosque, with radical Muslims leading prayers. Islamist infiltration of the Beltway is nearly complete. Drunk with “interfaith” tolerance, church officials agreed to let the Islamists make “a statement.” About what? How gullible they are? The 100-year-old Episcopal church, dubbed our “National House of Prayer” by Congress, is where we hold funerals for our presidents, like Reagan, and our heroes, like Neil Armstrong. There are few more powerful symbols of our Judeo-Christian culture than the cathedral — and that’s exactly why the Islamists targeted it. Read the rest of this editorial at Investor’s Business Daily.